This year for Anna's 5th birthday, she asked to have a Teddy Bear Picnic. Such a fun idea! Sadly, I'm not an awesomely creative party mom. 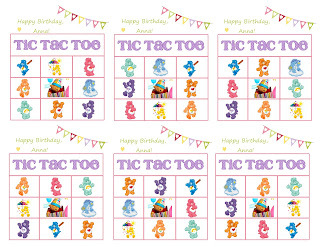 But I chatted with some of my friends who are party queens, then found some gorgeous printable party downloads on LeeLou Blogs. So, here's the results . . .
We started the party off with some coloring while we waited for everyone to arrive. I found free Care Bear coloring pages online and set them out with plastic cups filled with crayons. This made it easy for everyone to share and to keep them tidy instead of rolling all over the table. Once everyone arrived, we played a few games of Tic Tac Toe. This awesome template was part of LeeLou Blogs Valentines Day Templates. I used Paint.net to remove the Valentines Day, added "Happy Birthday, Anna!" and the Care Bear images. The munchkins used Smarties to mark their spots & of course got to eat them up after each round. And then it was time for the picnic! 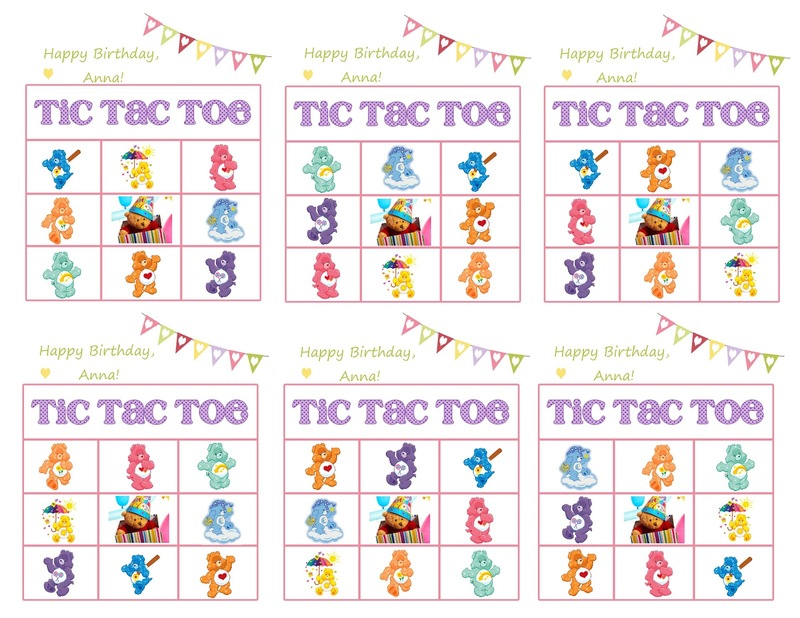 All of these awesome printables came from LeeLou Blogs Fresh Start Birthday Pack. the top one with a celebration message, the bottom with a child's name. Each person RSVP's with their choice of Peanut Butter (creamy or crunchy) and favorite jam (Strawberry or Grape). Added to the lunch were snack size zip bags of Gold Fish, green grapes & carrots, a squeezable applesauce pouch, and a mini-water bottle. Nutritious and oh, so easy! I spread a big blanket on the playroom floor & the munchkins all dived into their lunches. The conversation was hilarious to listen to - bad jokes and silly stories galore! When the first couple kids were finished, I read three picture books to the group to give the other kids time to finish their lunch. They all giggled as I read Alice the Fairy; Too Many Toys (both by David Shannon); and Twelve More Little Race Cars by Scott Pruett. Sugar cookies, frosting, and sprinkles, oh my! Dessert was a hands on activity and very delicious. Clean up was super easy too - I just wrapped up the table cloth and tossed it all. Then there was a flurry of wrapping and tissue paper as Anna opened her presents. Then we had a very short balloon-volleyball game while parents arrived to pick up their munchkins. What fun! I am glad it all went so well!